“Road Signs On Life’s Journey” Audio Book Now Available! 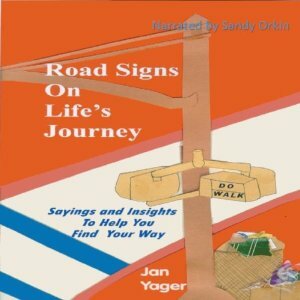 At Double RR Studios & Production, we recently completed the recording and editing of the audio book edition of Road Signs On Life’s Journey by Jan Yager, narrated by Sandy Orkin. The book is a collection of thoughtful and contemplative quotes. Words of wisdom about life by noted author and sociologist Jan Yager. Inspired by the realization that her oldest son would be leaving for college, this remarkable audiobook will be treasured by graduating seniors, college freshman, teens, and even adults. Covers learning, friendship, family, romance, love, time management, joy, and lots more. Yager is the author of numerous highly acclaimed audiobooks including When Friendship Hurts (Simon & Schuster Touchstone Books), in 28 languages, and Work Less, Do More (2nd edition), in 10 languages.